Attracting the best students from around the world has become a large and growing global export opportunity and source of competition. Policy-makers increasingly recognize the benefit of facilitating a globally-minded society, and of empowering their populations with the best ideas and skills that are provided by leading colleges and universities. More than five million students are studying outside their home countries. By 2025, the OECD forecasts that eight million students will be globally mobile. This figure is up from just 2.1 million students in 2000. This growth has occurred in the context of an increasingly globalized world. As that total population of mobile students has increased, so too has the profile of international education in academic, commercial, and government spheres. The benefits of foreign students, however, go far beyond the cultural diffusion of new ideas, new ways of thinking, trade policy, cross-cultural links, and diplomacy. This brings in capital from foreign markets, resulting in the export of an education service. Tuition, fees, and living expenses all benefit the local communities in which foreign students live, often over a period of several years of study. The reasons that countries undertake international student recruitment are varied. Two prominent reasons are (1) the belief that the presence of international students improves the quality of education, and (2) the belief that international students contribute to a knowledge society and economy. For some countries, a low birth rate encourages recruiting international students. One example of this competition for the “best and brightest” is the fact that the Indian government in early 2016 approved a proposal to admit an additional 10,000 foreign students at the India’s premiere engineering institutes. One of the Indian government’s goals is to improve the international standing of its leading institutions. In addition, foreign students will pay tuition that is significantly higher than tuition for Indian students. The 2001 values reflected here are drawn directly from the Institute of International Education’s Project Atlas, whereas the 2016 market share is based on the latest reporting from each destination country. 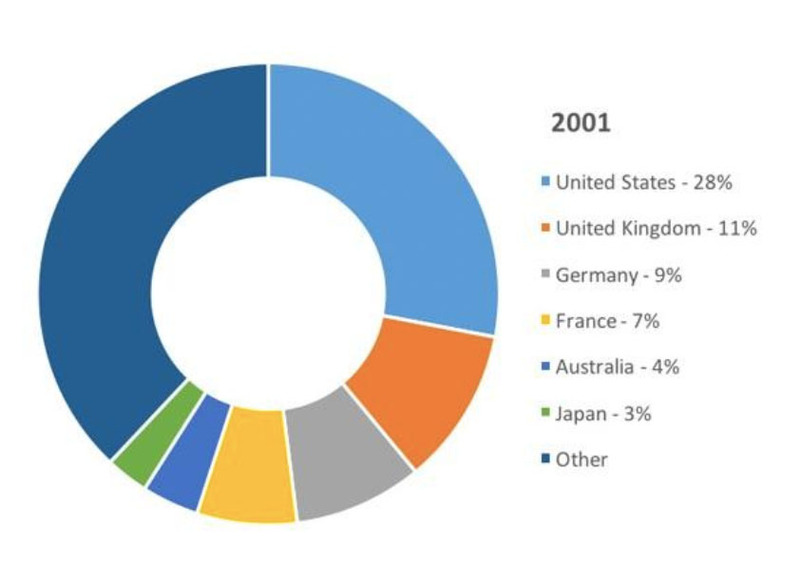 Global market share of internationally mobile students for leading study destinations, 2001 and 2016. Source: IIE/Project Atlas (2001). The US has lost share over the last 15 years. However, keep in mind that global student numbers have more than doubled over the same period, and so even with a lower proportion of that total the US remains far and away the world’s leading study destination. As a group, American colleges and schools have seen dramatic growth in foreign enrolment over the past decade and host more than one million students today. In 2015, these students contributed $30.8 billion10 to the U.S. economy. The UK holds steady in terms of global market share. It too had seen significant growth in foreign enrolment from 2001, but that growth began to level out around 2012 and has been essentially flat in the years since. The UK is more vulnerable to international competitors than it has been in the past. The British government has set a goal to recruit an additional 55,000 international students by 2020. 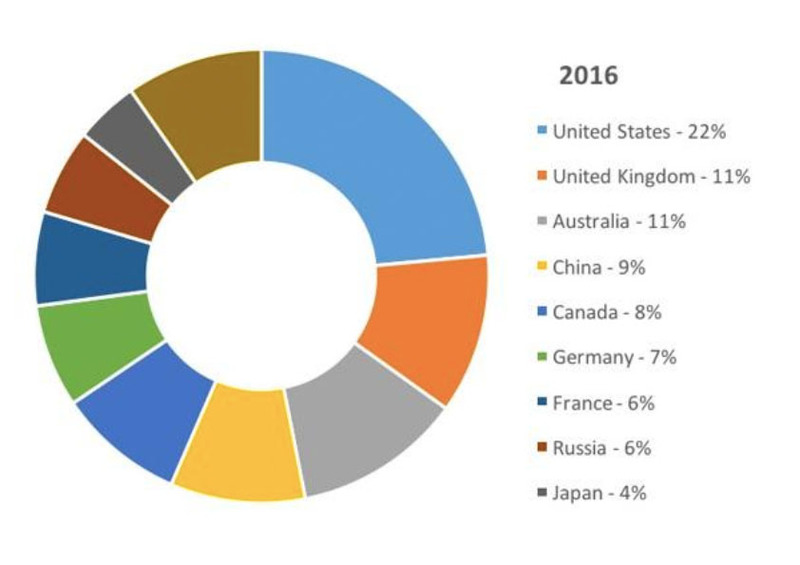 In terms of gaining market share, the big movers in the charts above are countries like Australia, Canada, China, and Russia. Each has notably increased its proportion of mobile students since 2001, and each destination has done so on the strength of substantial growth in its international student numbers. Australia’s current national strategy for international education sets an enrolment target of 720,000 international students by 2025. Standing on record enrolment of more than 550,000 students in 2016, and with average annual growth of 6.5% over the past decade, the country will probably hit that ambitious target. Canada is aiming for 450,000 students by 2022 and it too appears on pace to hit that goal. Particularly through 2017 and 2018, the country’s growing attractiveness as a study destination may well deliver above-average annual growth rates. China was not even on the chart in 2001, but has done well in building its international enrolment within the past decade. The country hosted more than 440,000 foreign students in 2016, well on track to reach its target enrolment of 500,000 students by 2020. Although China has a very large domestic market for higher education, it hosts only eight percent of internationally mobile students. This is likely to increase substantially as more Chinese universities offer courses in English and more foreign universities establish branch campuses or specialized programs in China. Germany has largely held its market share over the past 15 years, in large part because of its own steady growth in international student numbers in German higher education. Germany will almost certainly reach its target of 350,000 foreign students by 2020 as the latest data reveals that there were more than 340,000 enrolled in German institutions in 2016. France’s market share has slipped in recent years. While it hosts more than 310,000 foreign students today, its numbers are growing more slowly. France wants to reach its target of 470,000 students by 2025. Rounding out the list of leading destinations, both Russia and Japan have also registered important gains within the last several years. From just over 100,000 foreign students in 2004/05, total enrolment in Russian higher education reached 282,900 in 2014/15. And in Japan, two consecutive years of double-digit growth have left the country in a better position to reach its own ambitious target to host 300,000 foreign students by 2020. Overall, the outlook is for continued growth in international student mobility through 2030, but for a more complex marketplace as well – one marked by increased competition and by a widening distribution of international students across study destinations. We are already seeing a clear pattern toward a greater proportion of mobile students staying within their home regions. Similarly, the modes of education exports have expanded in recent years, particularly via transnational education where we continue to see increased provision of academic programming overseas via branch campuses, partnerships for local delivery, and/or online delivery. These will be among the major factors acting on enrolment growth and market share for individual destinations in the next decade.